5 Pk Colors: Yellow, Pink, Blue, Green, Orange. Broad and Fine Tip Highlighter. Pack of 10 cristal barrel black ball point pens. Medium sized point is perfect for any need. Pack of 10 cristal barrel blue ball point pens. Medium sized point is perfect for any need. Pack of 10 round barrel black ball point pens. Medium sized point is perfect for any need. Pack of 10 round barrel blue ball point pens. Medium sized point is perfect for any need. 12 count package of Dixon #2 pencils. Hexagonal cross section. 12 count package of Dixon #2 pencils. Triangular cross section of easy gripping. Pack of 4 .7mm pens contains one each of black, blue, red, and green, Premium gel rollers are super smooth and refillable. 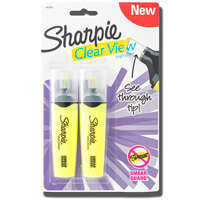 Innovative, blade-style tip delivers precise highlighting with the ability to select 3 different line widths. Features Smear Guard ink specially formulated to resist smearing when highlighting over many pen and maker inks (includes written notes, faxes, copies, newspapers and more- let ink dry before highlighting). 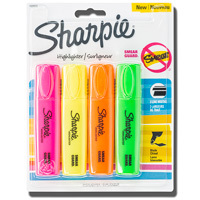 Set of 4 Colored Highlighters. Smear Guard ink specially formulated to resist smearing when highlighting over many pen and marker inks (includes written notes, faxes, copies, newspapers and more- let ink dry before highlighting). 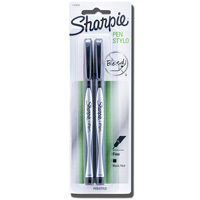 2 pack of black stylo sharpie fine point pens.